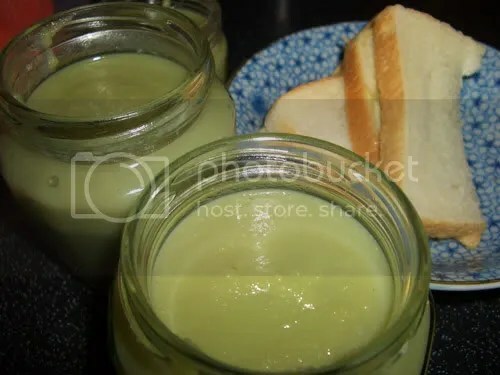 Posted by thelazychef in Bread. There was such an awesome smell that wavered through the house when this was baking in the oven! And the moment it came out, I couldn’t resist sinking my teeth into it! The quality of this roll is just fantastic. I added in lightly toasted walnuts into the cinnamon brown sugar filling and I really think it made all the difference! Everyone raved about it! After the dough has doubled in size turn it out onto a lightly floured surface, cover and let rest for 10 minutes. In a small bowl, combine brown sugar, walnuts, cinnamon and butter into a paste. Roll dough into a 16×21 inch rectangle. Sprinkle evenly with sugar/cinnamon mixture. Roll up dough and cut into 12 rolls. Place rolls in a lightly greased 9×13 inch baking pan. Cover and let rise until nearly doubled, about 60 minutes. Meanwhile, preheat oven to 400 degrees F (200 degrees C). Bake for 20 minutes or till top is golden brown. Enjoy! Notes: Bread best eaten on day it is baked. But this is quite a big portion and if you have extras you wish to have for breakfast the next day, place the cinnamon rolls in the microwave for 10 seconds to warm it up so that it’ll be hot and fluffy again! 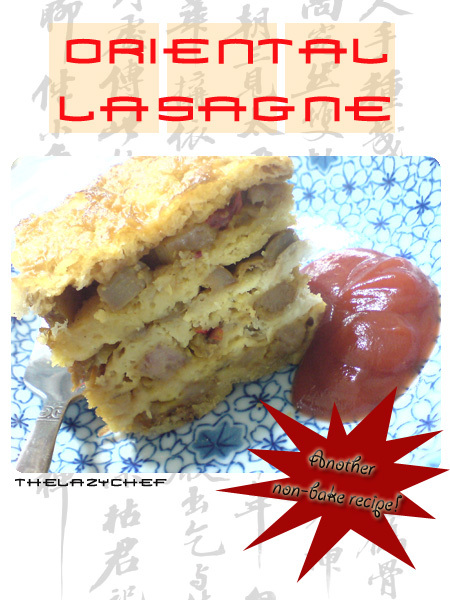 Posted by thelazychef in A note from thelazychef. I must say that it was a big decision for me to start blogging again, given my really busy schedule at work! It has been 4 years since I last posted and I must admit that I’ve grown slightly weary of blogging over the years. Even my personal blog has lost steam! However, though I stopped blogging, I didn’t stop baking and I have been baking/cooking very regularly for friends and loved ones. My colleagues, friends and family members can never get enough of my homemade goodies and always make special requests for sweet treats! I’ve grown to love cooking and love hosting friends at my house over a nice prepared meal or bringing along a savoury treat for picnics with friends. It is indeed such a joy to prepare and cook for friends and loved ones and though it can be tiring, I really enjoy the time spent in the kitchen and actually think that it’s such a therapeutic hobby! My intent of blogging again is to share the fun and simple recipes that I’ve been trying. I hope that you will continue to support me and feel free to ask any questions! I will try my best to teach/impart my experience to you so that you too, can experience the joys of cooking/baking! I’m currently in my final year in University and I’ve been super super busy with projects and reports. Am still struggling with my final year report! Urgh! Over the past few months, I been trying some new recipes(some successful and some not too successful…haha!) but I have not had the time to update regularly! My apologies also to all those who left me comments! I have tried my best to reply most of them! Hope it helps! I’ll try my best to post up a couple more recipes that I have tried recently! 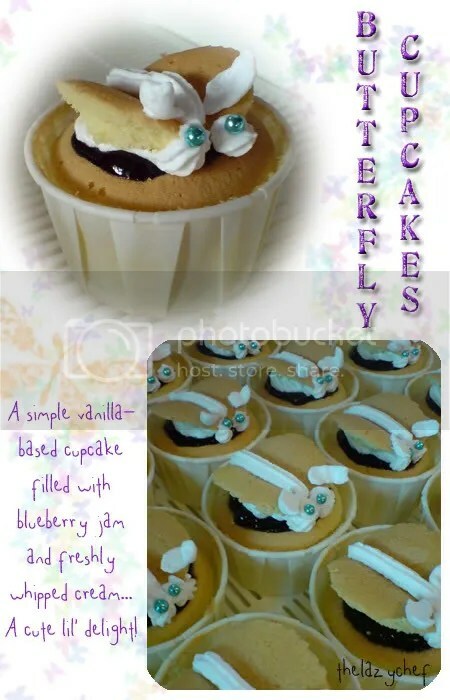 Posted by thelazychef in Muffins, Cupcakes and Scones. 1) Preheat oven to 180C.Grease a 21 cm tube pan. 3) On LOW speed, beat in 1/3 of (D). Mix until just combined. Beat in ½ the yogurt. Beat in 1/2 of the remaining flour mixture, followed by the rest of the yogurt. Lastly, beat in the rest of the flour. Take care not to overmix. 4) Measure out about half of the batter and fold in (B). Set aside. 5) Alternate large spoonfuls of the white and chocolate batters into the pan. 6)Use a table knife to marble the batters together in a zig-zag or circular motion, taking care not to blend them too much. 7) Bake for 45 to 50 mins till skewer inserted comes out clean. 8)Cool in pan for 10 mins. Unmold and cool completely. * if mixture curdles after adding in eggs, try adding in 2 tbsps of the flour mixture and beat on LOW. Mixture should look smoother, continue adding flour and yogurt. 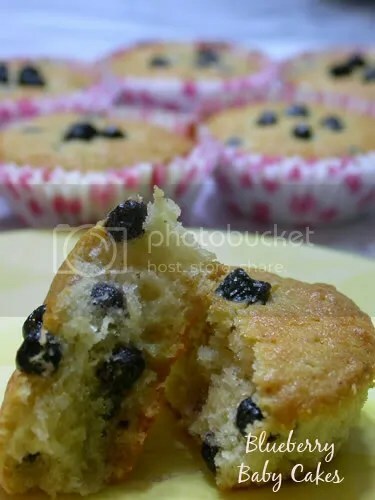 Posted by thelazychef in Cakes. Wow… I’ve been MIA for quite some time now! And so, I have nothing much to share because of that! But I won’t be sharing this recipe because it’s my aunt’s recipe and I didn’t get permission to share it publicly! I took a long hiatus again! I chanced upon this recipe on KC(by ilovebaking) and decided to give it a go! What a good choice! The cake was delicious! 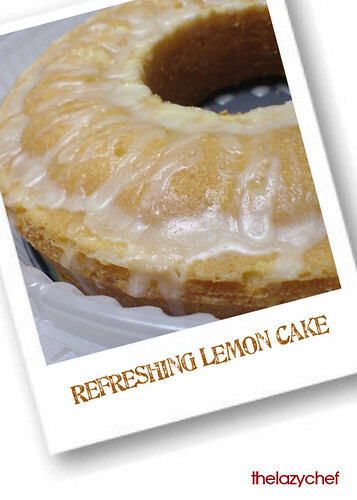 And the lemon frosting was a great compliment to the moist citrusy cake! Give it a try when you’re free! Its a relatively simple recipe with great results! 1. Preheat oven to 180C. Thoroughly butter and flour a 9-inch bundt pan; tap pan on edge of sink to shake out excess flour. Set pan aside.2. Sift flour, baking powder and salt into a medium bowl; set aside. 3. In bowl of an electric mixer, cream butter and sugar at low speed until blended, then beat at medium until mixture is very fluffy (about 6 minutes). Beat in eggs, 1 at a time, scraping down side of bowl after each addition. 4. Add lemon zest and blend. Add flour mixture to creamed mixture alternately with sour cream and scraping down side of bowl after each addition. 5. Pour batter into prepared pan; bake in preheated oven until a wooden pick inserted in center of cake comes out clean (about 50 mins to 1 hour). Cool in pan 20 minutes. Meanwhile, prepare Lemon Glaze. Turn out cake onto a platter; drizzle evenly with glaze. 1. Original recipe calls for 1 cup of sour cream which should be about 250ml of sour cream, but our supermarkets sells only 200ml tubs of sour cream! And so, I took a chance and used 200ml instead. It turned out fine. So if you have 250ml available, you may use 250ml instead. 2. If you love more lemon frosting on top, by all means, make another batch! 3. Original recipe calls for 2 cups of sugar. I REFUSED to use that much sugar because its so sinful! And so, the 1st time I made it, I used slightly less than 1 cup of sugar and still felt that it could have been less sweet (maybe its my low tolerance for sugar!). And so, if you prefer your cake to be sweeter, please adjust accordingly. I used 3/4 cup of sugar for my 2nd cake and when I licked the cake batter(heh… I love licking left-over cake batter! Its a gd preview of the actual cake! ), it tasted less sweet than the prev. cake. 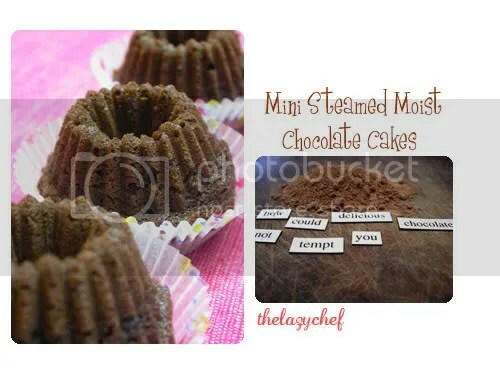 Posted by thelazychef in Asian Delight, Cakes. Haha… I’m sorry for disappearing for such a long time. Been extremely busy with school. And though I’ve baked a couple of times since I last updated, I don’t have the time to sit down and do the collages and post the recipes! When I first stumbled upon this recipe by Rusti at Kitchencapers, I was extremely intrigued by it! 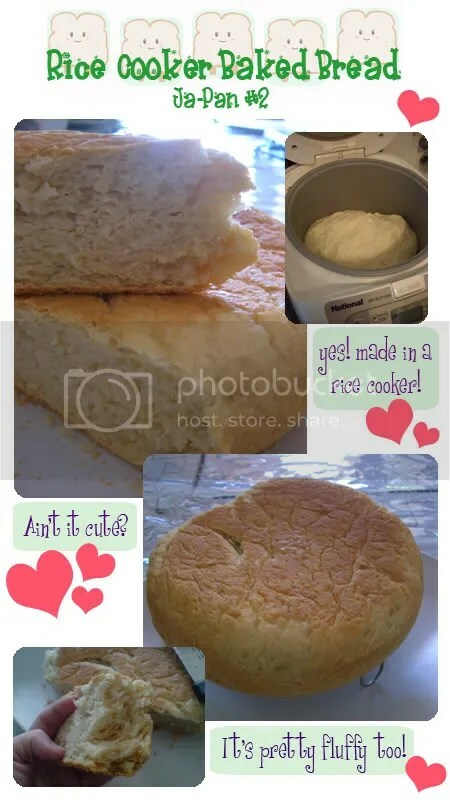 Firstly, because this uses cream crackers in a very unique way! I eat my cream crackers either with cheese or kaya, or dunk them into my milo or coffee… I never imagine that I could use cream crackers to make a dish! Unlike the traditional Italian lasagne, which has layers of pasta sheets and a tomato meat filling, this dish has layers of cream crackers and meat! I guess thats why its called ‘Oriental Lasagne’! Give this dish a try… Its very simple and doesn’t need baking! Serve this warm and with your favourite chili sauce or ketchup! Yum! 真好吃! Posted by thelazychef in Cookies. This recipe is fantastic. Really it is! Haha.. 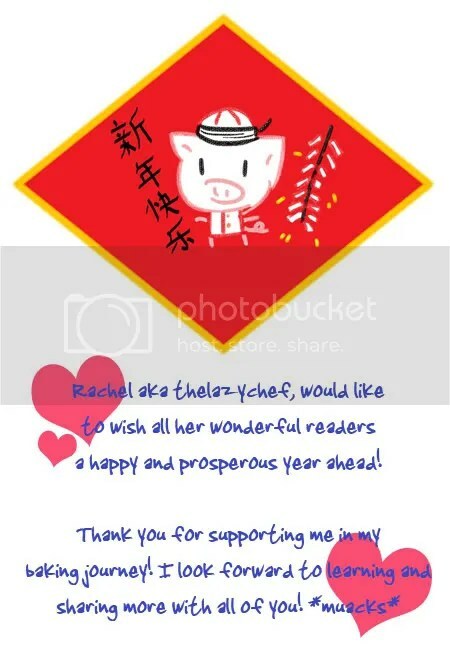 But, I’m so sorry to have posted this so late, else many of you could have made this for the CNY! An additional bonus? Its SUPER SUPER easy to make! Haha… It’s literally lazychef-approved! Cos its just dump all into one bowl, mix, shape and bake! I like! I first saw this recipe on Florence’s blog but I tweaked it a bit so as to add more peanuts(Since Daddy loves peanuts! In fact, he loved this peanut cookie so much, I had to make an additional portion!). 1. Mix ground peanut powder, plain flour, baking powder, icing sugar and salt in a big mixing bowl till well combined. 3. Pour in oil slowly and mix till a piable dough is formed. You might need a little more than the stated amount if the dough is too dry. 4. Shape into small bite-size pieces. I used a bottle cap and cling film to get a consistant shape. 5. Place about 2cm apart on lined baking sheet. Apply egg wash.
6. Bake at 170C for 18-22 minutes or till golden brown(depending on oven). 1. Use icing sugar instead of castor sugar to get a finer textured cookie. 2. If you add too much oil, the cookie would be very crumbly. 3. 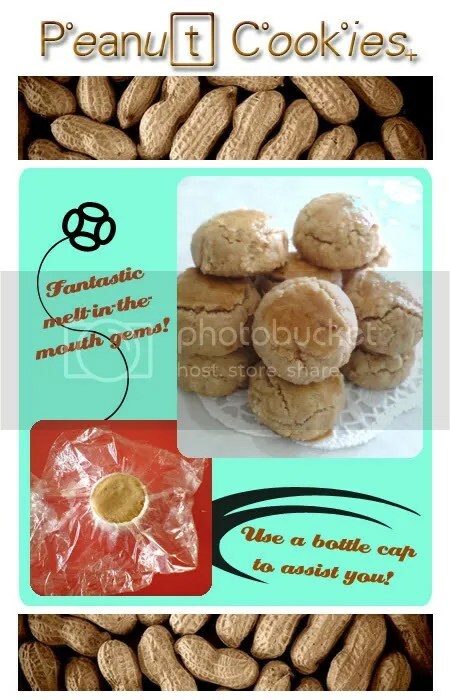 You may get the ground peanut powder from baking shops(like Phoon Huat in Singapore.) However, if you’re keen on getting the best cookies, I’d recommend that you roast about 250grams of peanuts and grind them into powder. But yes, the easy way out is to buy pre-ground peanut powder. Works just as well. Yes yes, I know, such a slacker huh? But well… it was a fantastic break… I enjoyed myself lots, even though all I was doing was relaxing… Heh! But unfortunately, all good things must come to an end! In fact, today’s the 1st day of school! But this sem, I have no classes on Mondays. How nice huh? No Monday blues! Weee! Yesterday, I made this pretty lil’ darling. I got a fantastic cupcake book from my bestie(Thanks Kai dear!) during christmas and I was so fascinated with this cake! Its simple, but yet, it looked so adorable. 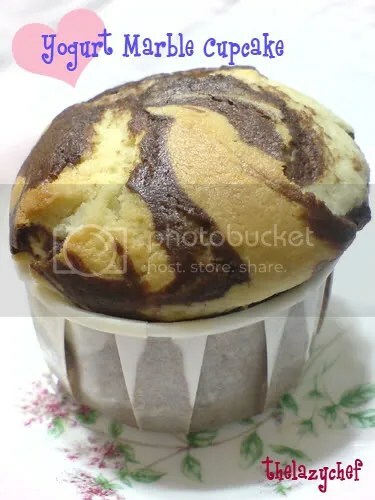 Yeap, its just a simple vanilla cupcake and you can put any kind of jam inside the cake! From strawberry jam, to mango jam or even durian pulp! Its really up to you! And so, with the newly bought cornmeal(I’ve been waiting very very long for this cornmeal… because I’ve been wanting to bake the famous Kenny Rogers corn muffins…), I decided to try this recipe. The original recipe required me to chill the dough, then roll it out and cut. But, I think the cookie dough was far too soft, and in our crazily hot weather, the dough soften really faster than expected. So in the end, I scooped out small heaps of the dough, rolled them into a ball between my palms, then I lightly pressed them down onto the cookie tray. Also, the original recipe was one that required vanilla essence… I have a huge bottle of pure vanilla essence(500ml!) which I picked up in Tijuana, Mexico when I was on my student exchange trip in the States. BUT, haha, I didn’t use it this time. Some how, my taste bud wanted something citrus-y and I grated in orange rind into the cookie mixture instead. Boy was I glad with the results! The little grittiness from the cornmeal, the orange fragrance, the chewy and slightly sour tasting raisin was a fantastic blend. Mmm… and guess what? I baked 3 dozen pieces yesterday and today, less than a dozen is left! haha… I guess it is a hit with everyone at home. In a large bowl, blend butter and sugar until creamy. Add egg and beat well. In another bowl, stir together flour, cornmeal, baking powder and salt; gradually add to butter mixture. Add orange rind and blend thoroughly. Stir in the raisins. Form dough into ball, wrap tightly in plastic wrap, and chill until firm, about 1 hour. Scoop out 1 tablespoon of dough and roll into a ball between your palms. Place 1 inch apart on lightly greased cookie sheet, then flatten slightly. Bake in 350 degree F (175 degrees C) oven for 15-19 minutes or until edges are golden. Store in airtight container. 1. You may reduce sugar to about 110g if you do not want it to be too sweet. The original was 150grams. I’m back! I’m back! I’m back! Weeeeeeee! 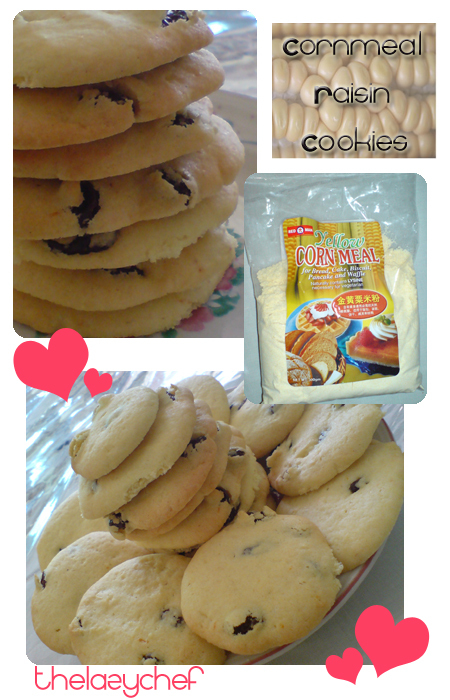 Haha… Sorry for the over excitement… But I miss baking and cooking so much!!! And yes, for my very 1st bake: Bread ‘baked’ in a rice cooker! Someone in the forum that I frequent(KC), introduced us to this clip which shows how bread can be made in a rice cooker! And I told the fellow people that I’ll give this a try once my exams are over! Some background on how this bread was created. There is a popular anime series in Japan called “Yakitake!! Japan”. Yakitake means ‘freshly baked’ in Japanese and well, Japan has a double meaning: first being Japan as a country, and Pan is the Japanese translation of ‘bread’. The anime’s story is about a boy called Kazuma Azuma who posessed solar hands and is a prodigy at baking bread(because the yeast thrive very well in his warm hands, allowing his bread to rise faster). Ja-Pan#2(yes, he names all his bread ‘Ja-Pan #X’ where X is the number) is one of the bread that he creates using a rice cooker. 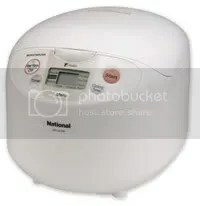 I was rather intrigued when I first read about and watched the clip and since I had a modern rice cooker, I thought it would be a good experiment to take on! This is a very simple recipe however it is very time consuming(took me 5 and 1/2 hours! ), so I’d advice that you make this only if you’re very free(like me now! hahaha!). And you MUST have a modern rice cooker to bake this. Why the modern type? Because it has a timer capability that allows one to set the timer. Also, they come with a micro-computer that adjust a constant temperature while you cook your rice, porriage, slow-cook etc… For the older types, all they have is one button that you press down when you want to cook your rice. This bread had a mellow, a slight salty taste to it and was a lil’ chewy. I guess this must be due to the fact that Japanese like chewy and sticky food, like their mochi and rice… I feel that the butter and milk both made this bread very fragrant and enhanced the taste of the bread. 1. Mix some warm water with the yeast and put aside. 2. Put in the remaining ingredients, except the butter. 3. Mix and knead until all the ingredients combine together and you can shape it into a ball. 4. Take the ball of dough and put the butter into the centre of the dough. Knead the butter into the dough until it combines together and the dough becomes less oily and less sticky. Shape into a ball shape again. 5. Leave the dough in the rice cooker pot and cover with a cloth, let it rise for an hour in a warm area(primary fermentation). 7. Put it back into the pot, cover and let it rise again for another hour(secondary fermentation). 8. Put pot with risen dough into the rice cooker, set timer for 1 hour. 9. After it finishes the 1st cycle, turn it over using a spatula. Start the 2nd cycle of 1 hour. 11. When the 3rd cycle has completed, remove the bread and leave it on a wire rack to cool. 1. I poured out 180ml of warm water and used part of it to mix the yeast, because I read somewhere that someone had problems with a sticky dough, so I didn’t want to add too much water. 2. 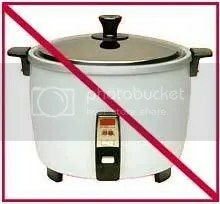 In the final cycle, I would suggest that you check on your rice cooker because for my case, the thermostat kept shortening the overall cooking time because the rice cooker was hot inside and didn’t need the time to heat up the food that was inside. Sorry for the delay in this posting!!! And yes, back to the cheesecake. But thank goodness, the cake was well received by the ladies at my mum’s gathering and yes, it still tastes wonderful. The tangy taste from the lemon complements the sweet blueberry jam. And though the cheese portion was ultra-rich, the thick biscuit crust helped to tone it down. 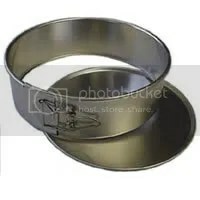 1) Prepare a 8 inch loose bottom or springform round cake tin. Wrap loose base of tin with aluminium foil or parchment paper. 2) To prepare base, melt butter . Use a little of the melted butter to lightly grease bottom and sides of cake tin. 3) Place biscuits in food processor and process until finely crushed. Transfer to a bowl. Add melted butter and stir until crumbs are moistened by butter. Transfer crumbs to the prepared cake tin. Press crumbs until it is flat and compact. 4) Preheat oven at 180 degC. Place the tin with the crumbs into the oven and bake for 10~12 minutes. 5)Cream cheese and castor sugar until light and smooth. Add eggs one at a time, incorporate it well into cream cheese mixture after each addition. Do not overbeat the eggs. 6) Add juice and whipping cream. Beat well. 7) Finally, fold sifted cornflour and grated rind into batter. 8.) Pour cream cheese mixture over biscuit base. Tap sides of cake tin a little to break large, noticeable air bubbles on the surface of filling. 9) Bake cheesecake using top and bottom heat of oven at 170degC for 40 mins or until surface of cheesecake is just set/cooked. The whole baking should take about 35-40 minutes. 10) Leave to cool. Run a thin knife blade carefully around inside rim of tin to loosen the sides of cheesecake. Remove cheesecake from cake tin. Unwrap aluminium foil from base of cake tin. Transfer the whole cheesecake, with the aluminium foil, to a cake board. Wrap aluminium foil over the cake board. Refrigerate cheesecake overnight. 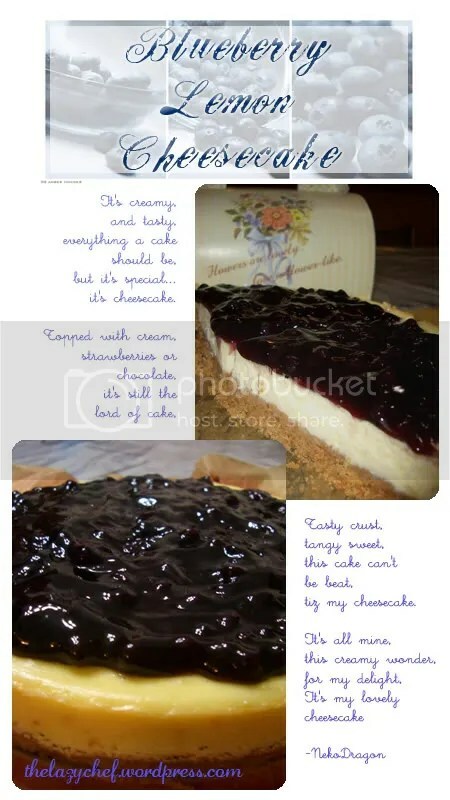 11) Decorate top of cheesecake with blueberry filling. Posted by thelazychef in Uncategorized. Actually, I made a black forest swiss roll last week! Yummy! But it cracked slightly while rolling and I refuse to post the picture of it. So ugly! haha… I’m a bit hesistant to try making it again, but the next time I do it, I’ll post the picture and recipe k? This week, I’m gonna bake a blueberry cheesecake. This time, I promise to post the pic and recipe when I’m done with it! For now, please enjoy the other entries k? 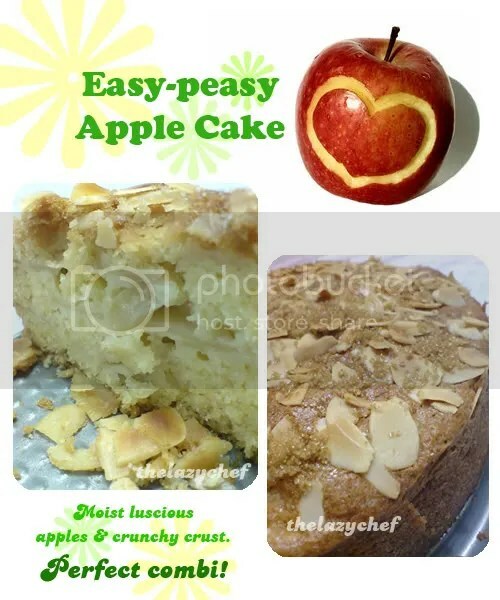 Posted by thelazychef in Desserts. Crazily hot… and now, its sooo hazy! Argh! And so, what a better time to cook something cooling! I posted this recipe in KC quite some time back, but now, I’ll share this here. 🙂 Definately a good dessert for the old and young… And here’s a tip! Chill it cos it’s super refreshing to have a nice cold dessert in our ridiculous weather!!! And and and…. the best thing about this recipe? Its ULTRA easy to make! Yay! This recipe has no strict rules to it. Just dump all ingredients into a big big pot(trust me on the BIG part, cos you can chill leftovers and everyone will gobble it up in a day or two…) and boil till it is fragrant and all the ingredients is soft! 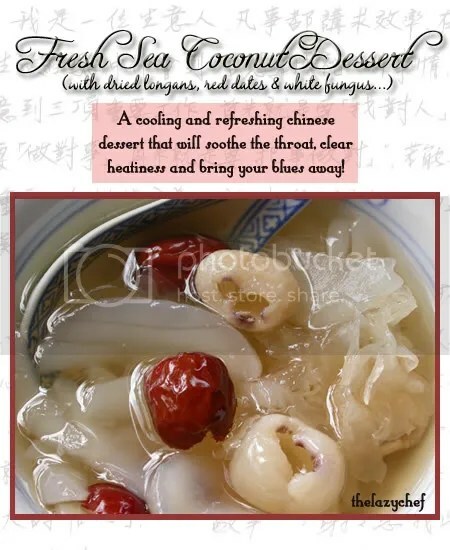 Remove the light brown skin off the sea coconut, it should slide off easily for those soft ones, slice the sea coconut into about 5~8mm thick slices. In a large pot, boil water(~1500ml, depending on pot size). Put in the sea coconuts that are firmer to cook first(this is to soften them first). After about 10 minutes, put in the rest of the ingredients. Once the water has come to a boil again, lower the flame intensity and let it continue to boil till the soup turns light brown in colour and taste flavourful. There is no hard and fast rule to the making of this dessert. So, its really up to you to estimate how much ingredients you need. If need be, add more longans and red dates for better taste! Ask the vegetable seller to choose a packet of sea coconuts which are softer, cos soft sea coconuts taste better and are much easier to cook! This wedges are best eaten when fresh from oven as it is crispy on the outside and hot and fluffy in the inside. And it doesn’t taste that good once it’s cool. So it is very important to time your main meal appropriately when the potato is almost finish roasting. With this recipe, you can forget about buying all those frozen fries and deep frying it in all that oil. 1) Cut the potato sticks, and put them into a pot of water(tap water will do) to get rid of extra starch in the potatoes. 2) After soaking for a while, rinse the potatoes & drain well. Return them to the pot with enough water. Add 1/2 tsp salt. Put on stove and bring them to a boil. As soon as it boils, reduce heat & boil for 3 mins. Drain the potatoes well & spread them on a kitchen paper towel to dry. 3) Preheat your oven to 220 degrees celcius. Place the potatoes strips on a large baking sheet. Make sure you do not overcrowd. Sprinkle olive oil generously over them. Gently toss it to mix well with the oil. 4) Put the baking sheet in the hot oven. Roast for 15 mins. Remove baking sheet & turn the fries over & continue to roast for another 15 mins or until it´s well browned & crisp. 5) Remove from oven & immediately sprinkle with salt over the hot wedges & serve immediately. Notes: I normally do not sprinkle salt onto the wedges after it is out from the oven as I prefer the natural sweetness and taste from the Russet potatoes. And yes, USE Russet potatoes for best results! For those who don’t know, this is a typical Chinese savoury snack. It is often eaten during breakfast or as a tea-time snack… And it goes very well with spicy chilli sauce. There are several variants to it, where the pumpkin can be substituted with carrots or yam. 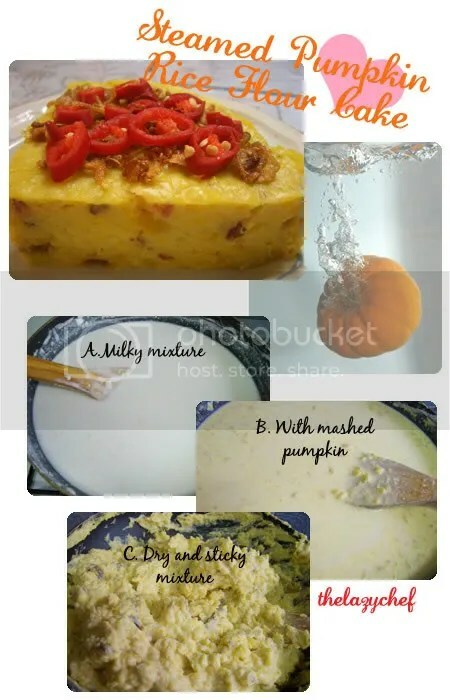 So I searched around for a recipe that used pumpkin as its main ingredient, and I found this lovely recipe from Kitchencapers and it is by Gina, the kind and lovely owner of the forum. I adapted her recipe slightly though, since my family wanted chinese sausages in the cake. This recipe’s process is rather tedious(for someone so lazy like me!) but the results are worth it! So, since Halloween is coming, give this pumpkin treat a try! 2. Mashed while its still hot. Set aside. 3. Using 2 tbsp of cooking oil, stir fry minced dried shrimps till it is fragrant. 4. Add the sliced mushrooms, chinese sausage, waxed ham and seasonings. 5. Stir fry for 3 mins. Set aside. 6. In a separate wok, add hot water slowly into batter mix flour and stir constantly. Do not turn on Fire yet!! Stir till flour dissolves. Mixture will be milky(like in Picture A). 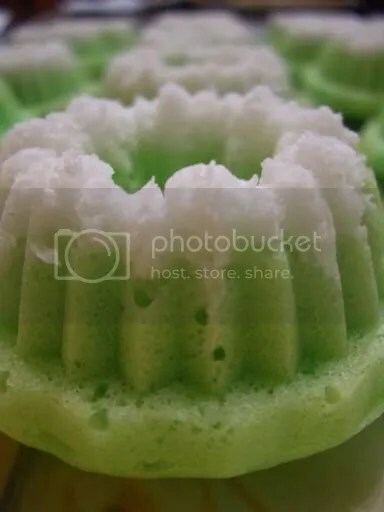 Do not pour in hot water all at one shot, but slowly add and stir at the same time, this is to ensure that the rice flour do not get cooked suddenly by the sudden addition of hot water(and become sticky and lumpy). 9. Stir to mix everything evenly. 11. Lined a square pan with cellopane paper(glass paper) and pour contents into it. 12. Steam over high heat for 60 minutes. 13. Leave to cool in room temperature for 1 hour. 1. Uneaten pumpkin cake can be stored in the fridge for up to 1 week. To serve, just re-steam it or you can pan fried with a beaten egg. 2. Serve hot with chilli sauce, tomato sauce. 3. This recipe yields 2kg of pumpkin kueh. Just follow the same recipe as the huge standard version, but this time, add chocolate chips into the batter, and steam them for 8 to 10 minutes. Simple as that! I’m back in Singapore. Actually I was back since early August but I was busy preparing for my new school term(in fact, I touch down in Singapore on the first day of school!) and getting in tune to school life again… I’m in Year 3 now, so I told myself, I must be more serious in my studies from now on! US was wonderful! Had so much fun! I visited so many different cities- San Diego, Tijuana in Mexico, San Francisco, Las Vegas and Palm Springs… Visited several national parks and amusement parks like Disneyland and Universal Studios… I’ll post a couple of pics once I have collated all my pics and have time to sort them out! Food in the States was good… though portions were ALWAYS huge! Being a small eater, I always had to share my meal or couldn’t finish my own portions… My friends and I had lots of pizzas, mexican food, margaritas, churros, pancakes, burgers, and other typical American food when we were there. I'm going away tmr, to the States for a 6 weeks Summer Exchange Program at UCLA. Doubt I'll have any chance to bake while I'm there… But I'll be cooking for my group of friends though, so I'll post up any recipes that I've tried and are nice. But yes, unfortunately, I'll miss my oven lots when I'm away! I've been busy packing and getting ready for my trip, sorry I've not been updating as regularly! I may not be able to blog as much when I'm the States too, but I'll update as often as I can! The sound of it just sounds so cute doesn't it? This recipe uses a tub of natural yogurt, making it moist and soft. 1. In a small bowl, add yoghurt and blueberries to mix together. 2. Let it stand for 30 mins(room temperature). 3. In a cake mixer bowl, add butter and sugar to beat till creamy. 4. Add eggs, 1 at a time to mix. 5. Add vanilla essence to mix. 6. Turn off cake mixer. 7. Add blueberry yoghurt mixture and mix with a spoon till evenly mixed. 8. Fold in sifted flour/baking powder till well blended. 9. Put paper cups into muffin tray. 10. Spoon mix into each cup. 11. Baked in preheated oven 180C for 20 mins till golden brown. 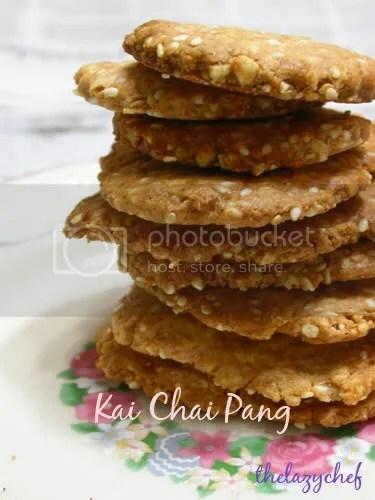 For those who don't know, this biscuit originated from Kampar in Perak, Malaysia. It's original recipe has lard in it! Yes! Very unhealthy! This recipe that I tried is adapted from Amy Beh's version of this crispy savoury biscuit. Its easy to do because all you need to do it to mix everything up and you can do it all in one bowl! And yes, its much healthier than the original one cos it has no animal fat in it! 1. Preheat oven to 160 degree C. Line baking trays with parchment paper because the cookies will stick to the baking pan. 2. Combine all the dry ingredients and mix well. 3. 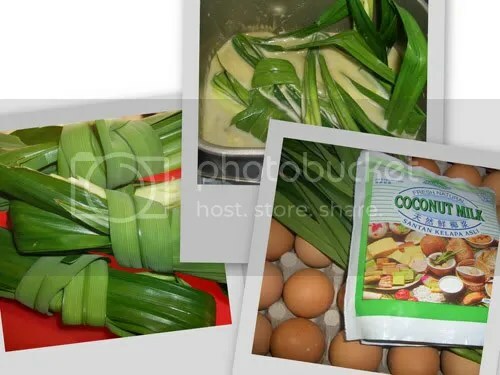 Mash the nam yue and combine this and all the other wet ingredients together with the dry ones. 4. Mix and knead gently into a soft dough. 5. Roll dough into small marble size pieces. 6. Place each marble sized dough between 2 pieces of parchment paper and flatten with rolling pin. 7. Transfer to baking tray and bake for 15-25 min or till golden brown and crispy(time taken depends on how thick and big your biscuit is). 8. Cool on wire rack and store in an airtight container. 1. I added 2 1/2 pieces of nam yue because I read up from the other ladies in KC that the original recipe called for 1 piece and it wasn't enough. 3. I did a research on ammonia powder since I didn't have it in my kitchen and didn't want to buy it just for this recipe… ammonia powder was very popular in the olden days. It yield a very light , airy product, but can impart an ammonia flavour to baked goods, though this can be prevented if the cookies are thin and allows the ammonia smell to evaporate. It is best used in cookies which are flat enough to allow the ammonia to dissipate during cooking because ammonia is heat activated. You may substitute one teaspoon of ammonia powder = one teaspoon of baking soda PLUS one teaspoon of baking powder. Steam shredded coconut for about 5 to 8 mins. 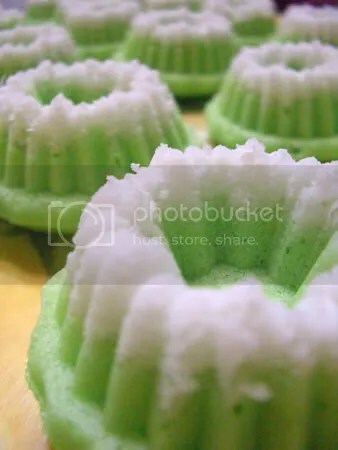 Place some steamed coconut into the base of a mould. Use another mould to push the coconut into the mould and press hard on it. Do the same for all the moulds. Add the coconut milk and flour alternatively into the egg mixture and mix well. Spoon mixture into prepared mould and steam on big fire for 8-10 mins. These are the moulds which I used to create this little jewels! 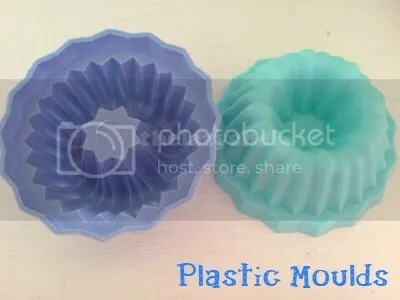 You can get them from any baking shop or shop that sells plastic ware and home ware. I made this for Mother's Day… for my grandma, aunties and my mummy! Didn't have time to make the tartlet cups, so I bought them! Hehe… But they were good. Nice and crisp. And the colours of the fruits made it so cheery! Aren't they pretty? 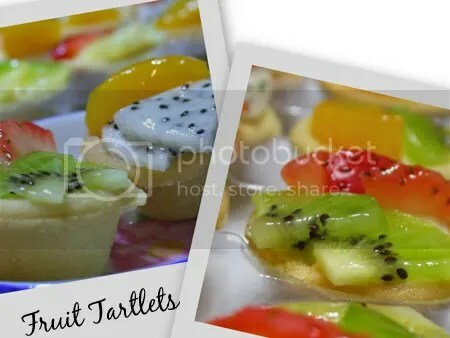 I would have made the tartlet cups on my own if I had the time but I was rushing around and just didn't have enough time to settle down to make them. Anyway, this batch that you see here is what I made yesterday. I decided to bring some for my project group mates to cheer them up. We're all up to our necks with the project at hand and I thought this would be a nice pick-me-up!